Cambridge House® by The Santa Barbara Smokehouse® uses only the highest quality Atlantic salmon. Fresh fillets are hand-cured with our proprietary blend of Pacific sea salt and brown sugar and artfully smoked in our open-fire smoker. Specially selected woods and herbs give each product its distinctive, signature flavor. These fine, smoked salmon delicacies are all natural and ready to eat — with no artificial preservatives. 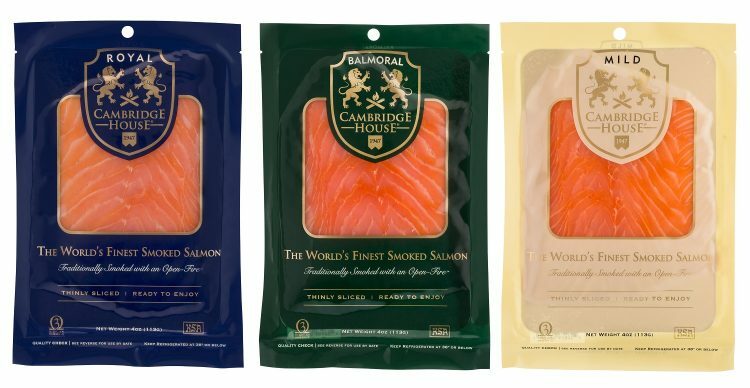 With a recipe that remains unchanged for over 6 decades, Cambridge House Royal® is the world’s most distinctive and charismatic smoked salmon. After selecting the finest quality fresh Atlantic salmon, we hand cure it with pure sea salt and fresh herbs then smoke in small batches using local fallen oak logs and apple wood from the Santa Ynez Valley. This local area is home to some of the worlds finest vineyards and for that reason we also select and burn aged oak chardonnay barrels which completes this very unique recipe. The salmon is then fully trimmed by hand to remove all dark meat, sliced paper thin, and vacuum packed fresh. With its rich buttery texture and robust smoke flavor, this smoked salmon is our original flagship recipe and remains so unique in flavor that although it is often imitated all over the world, it cannot be copied or equalled. Taking only the finest quality fresh Atlantic salmon we hand cure with pure sea salt and fresh herbs then smoke in small batches using aged oak whisky barrels. The salmon is then fully trimmed by hand to remove all dark meat, sliced paper thin, and vacuum packed fresh. With its rich buttery texture and medium sweet smoke flavor, this smoked salmon melts in your mouth and is reminiscent of the Scottish Highlands cure. Taking only the finest quality fresh Atlantic salmon we hand cure with pure sea salt then smoke in small batches using local fallen oak logs from the Santa Ynez Valley. The salmon is then fully trimmed by hand to remove all dark meat, sliced paper thin, and vacuum packed fresh. With it’s delicate, very light smoke flavor, this salmon is the quintessential “London Cure”. All three flavors are available in 4oz packs as well as full sides. Contact us for pricing. of our Cambridge House® products.